If you list the uniquely wonderful characteristics of the ports, the conclusion is inescapable. Canada and New England is one of the best cruise destinations. 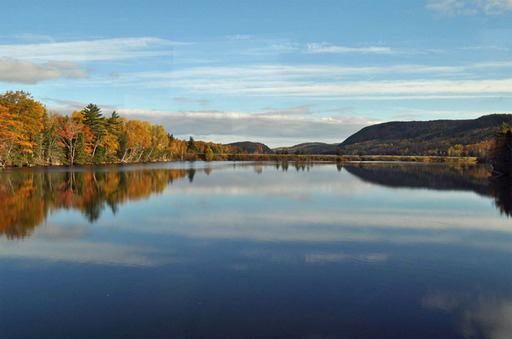 Quebec Province offers the “best of the French experience” in the cities, villages, and countryside. The “official” spoken and written language is French. ​Enjoy the cafes, bakeries, and superb cuisine. 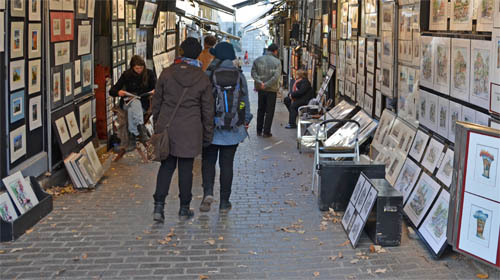 Visit museums, art galleries, and shops, especially the upscale shops. 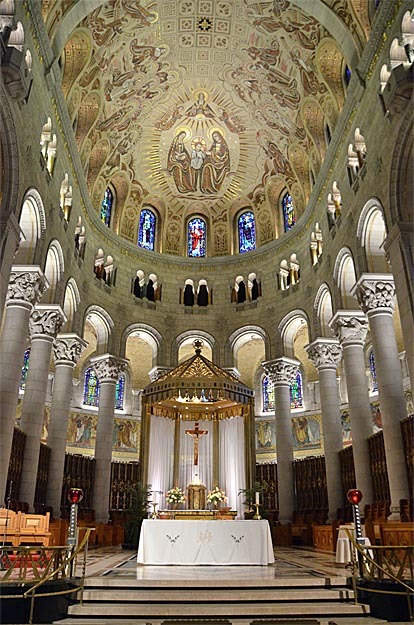 Note the impressive architecture, churches, colorful buildings, beautiful parks, and more! 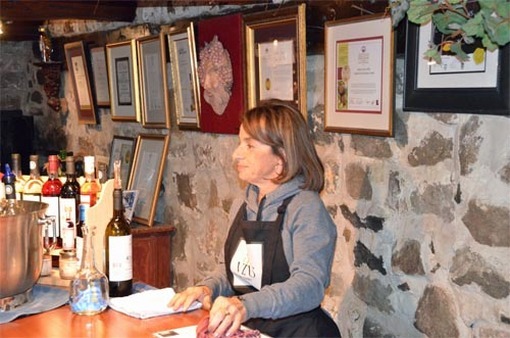 Tour the award winning vineyards and visit the art galleries and antique shops on Ile d' Orleans. Canada and New England ports offer fantastic opportunities for postcard photos. Sandstone cliffs are carved by waves, tide, and rain along the Atlantic coast to form interesting shapes. Teapot Rock is a sandstone formation standing above the sea in front of a red sandstone cliff. 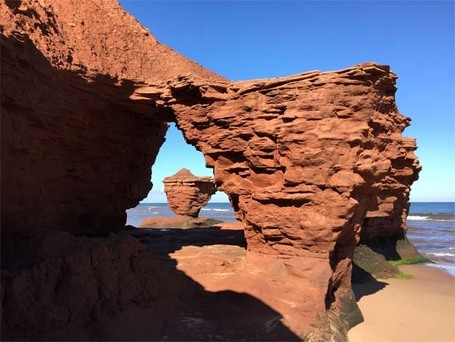 In 2013, it was featured in National Geographic Travel Magazine as a “stunning view of Prince Edward Island”. The photo above was taken by my friend Brian Pokosh. 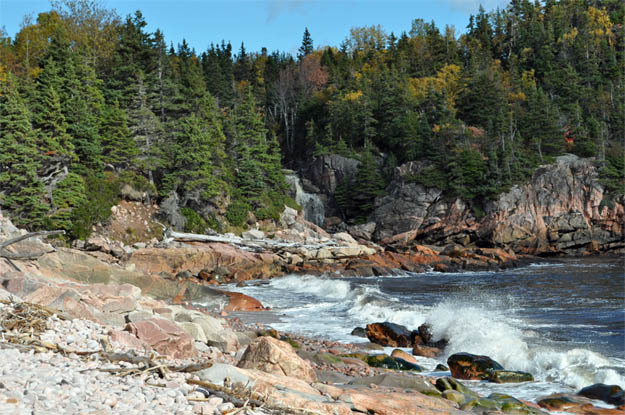 The photos at right show a calm lake surrounding by mountains and waves crashing onto a rocky shore with a waterfall in the background on Cape Breton Island. When you're taking photos, keep and eye out for wildlife i.e. birds, fox, bear, whales, etc. There are several opportunities to re-live history with the help of lecturers at historic sites, well informed tour guides, and re-enactors dressed in period costume to take you back in time to experience what life was like years ago. In the summer, you'll find re-enactors at many sites on Cape Breton Island to introduce you to the rich Celtic history of settlement by Scots. 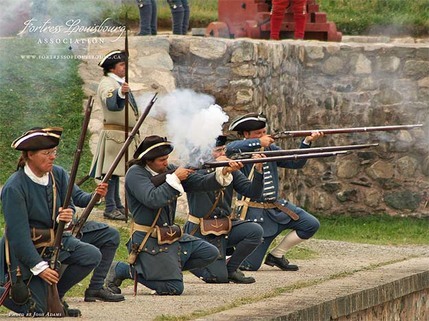 There are a variety of re-enactors such as these soldiers (photo left) at Fortress Louisbourg near Sydney. This is a very impressive historic site. NOTE: Schedule a cruise in June-August to see the re-enactors. These sites close for the season in early September. 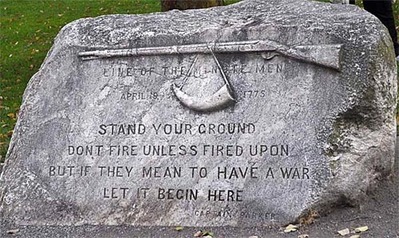 Tour the Minute Men battlefields from Lexington to Boston. Walk with a guide to explain the history and point out the sites. 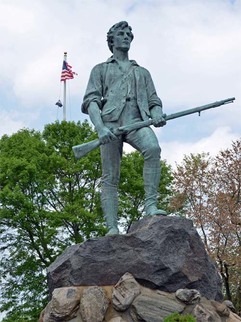 Minuteman Statue in Lexington (photo left). Hear the story of Paul Revere “one if by land, two if by sea”. Walk the decks of the USS Constitution. 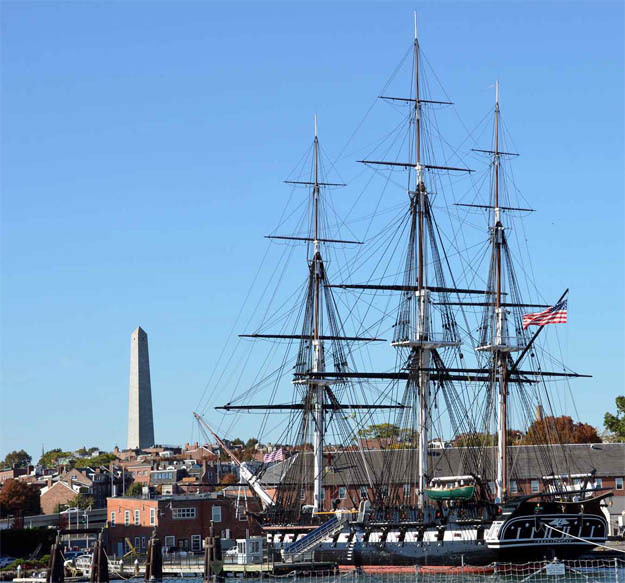 ​The USS Constitution won all her engagements in two wars and defeated four English warships in the War of 1812. Her nickname was “Old Ironsides” because cannon balls bounced off her 21-inch thick oak hull. NOTE: Touring the historic sites is an enjoyable experience for young and old. Visiting the historic sites with re-enactors and guides is a great summer vacation for a family with children and old people like me who like to think they are young. 4) Saguenay is the most friendly and welcoming port on the seven seas! You will be greeted at the dock by re-enactors in period costume representing the history of the area as fur traders, Indians, local craftsman, school children, town officials, etc. It's an incredibly warm welcome. They engaged us in conversation, told us about the area and treated us with fresh baked blueberry pie, maple toffee candy, blueberry chocolate, etc. It was like meeting old friends. The cruise terminal is a state of the art, modern, facility. It's filled with high quality, distinctive products by master artisans/craftsmen including custom design clothing, hand made purses, blown glassware, jewelry, artwork, wood carvings, etc. In Europe, ships often dock in large industrial ports. You're held captive, wasting time, while you wait for shuttle buses to the port city. Tourist sites are often far away, transportation options are limited, and the ship's excursion bus tours are pricey. In Canada and New England, the ship docks or tenders you into the center of the port city making it easy to personalize your tour. You can walk to many of the tourist sites. In almost all ports, there are many things to see and do near the dock and several options for self-guided touring including walking, public transit, carriage rides, trolley tours, bus tours, etc. to explore the area. I rent cars in some of the ports such as Charlottetown, Sydney, Halifax, Saint John, Gaspe' and Quebec City to enjoy convenient travel over a wide area beyond the port. NOTE: Plan ahead for touring from Sydney Nova Scotia and Gaspe' Quebec. There is not much to see or do near the dock; you'll need transportation to the tourist areas. ﻿Many ports offer “active touring” where you can rent bicycles for the miles of trails or kayaks to explore the harbor area such as the majestic fjord in Saguenay. In Boston, a harbor cruise is a great way to see and photograph unobstructed views of the skyline. In Newport, you can take a sailing tour of the harbor. Naturalist tours to sail along the rugged coast line to see some of the mansions, bald eagles landing in their nests, seals, lighthouses, etc. We loved the naturalist boat tour. Another interesting tour is the lobster boat. It's clean, comfortable, and the tour is very informative. The captain explains the process as he catches lobster. There is a marine biologist/guide who explains the unusual characteristics of lobster. She puts rubber bands on the claws so you won't get pinched and takes the lobster around so you can touch or hold them. 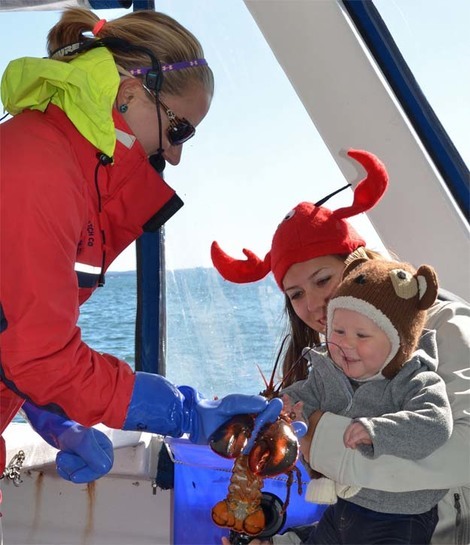 The photo at right shows a small child touching a lobster. This is a great excursion. I loved it and learned a lot. Canada and New England ports offer a wide selection of excellent cafes, restaurants, and pubs. ​ALL ports offer excellent seafood, some of the best in the world. Each port has its unique offerings of food and many have local wines and beer. For 180 years, Durgin Park Restaurant in Boston has served it's Yankee Fare including pot roast, baked beans, New England clambake, oysters, corn bread, chowder, Indian pudding, Apple Dowdy, etc. Visit “Sugar Shacks”, cafes, and fine French restaurants in Quebec. There are local breweries in many ports serving excellent pub food. Halifax has the highest number of pubs per-capita in Canada. The Black Pearl Restaurant in Newport has the best chowder in New England. One of my favorite small restaurants is the Water Prince Corner Shop in Charlottetown. It has outstanding seafood including lobster, chowder, and Prince Edward Island mussels. 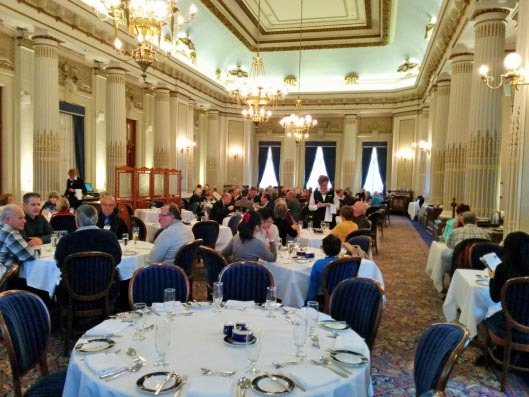 For a special occasion, have breakfast or lunch at Le Parlementaire Restaurant in the Parliament Building in Quebec City. See http://www.assnat.qc.ca/en/visiteurs/restaurant-parlementaire/ ​Photo at right courtesy of Brian Losie. This magnificent beaux arts dining room offers a menu worthy of the most refined palates and it's open to the public. It features produce from the Parliament gardens and honey from its beehives that inspired chefs in preparing the summer menu. Ask your staff which delicacies on your plate were harvested that day. ​My friend Brian Losie had lunch here with three friends. They enjoyed BBQ ribs with Kale and Cornbread with a Corn soup starter and a Cheese and Tomato tart. The food, setting, and French Bordeaux were fantastic. Plan Ahead: Do a Google search to find the cafes, restaurants, pubs, and vineyards you wish to visit. Some cruise ports in Central & South America, Europe, the Mediterranean, and even the Caribbean raise issues/concerns for the traveler about personal safety. When our ship docked in Nassau in 2015, we received a Travel Advisory warning of armed robbers in the main, downtown shopping areas. We did not get off the ship. After we booked our 2016 Mediterranean cruise, Tunisia and Istanbul were removed as ports of call due to safety concerns. Tour with your children, family, and friends and focus on enjoying a memorable cruise vacation exploring the area without concern for personal safety. 8) The cruise season is late April through October - Best Time to Cruise? Canada and New England is a great cruise destination from late April through October. June through September is the main tourist season and the best time to see street festivals, concerts, etc. in the cities and the re-enactors in Celtic period costume at Cape Breton Island and the re-enactors at historic sites such as Fortress Louisbourg near Sydney, Nova Scotia. Activity at Fortress Louisbourg decreases in September. You can visit the fortress in October, but most of the buildings and services will be closed and the site will be empty. In October, tourist sites and restaurants in the remote areas begin closing for the season. This is not a problem if you on on a ship's excursion because restaurants and many of the tourist sites will open for cruise ship tours. In the populated cities and towns, restaurants and shops remain open to serve the locals and tourists. Fall tree colors are beautiful, but this is NOT the only reason to cruise this area. The fact is, the landscape is beautiful year-round. The “peak” season for fall color begins after the first “hard frost”. It's hard to predict when that will occur and peak fall colors only last a few weeks. It can be cold in October. My wife needed gloves and scarfs during one of our fall cruises, at least that's the reason she used to visit the high end shops in Quebec City. Some cruise lines only sail in September-October so they list “fall foliage” as the primary reason to cruise this area. That's like a car dealer who is only open on Saturday advertising, “Saturday is the best day to buy a car". Carnival sails from New York to Canada & New England June-October. Holland America sails from Boston to Canada & New England from late April-October. Holland America also sails to Bermuda from Boston. The section below lists the ports as they appear on this map from south to north, then west to Quebec City. 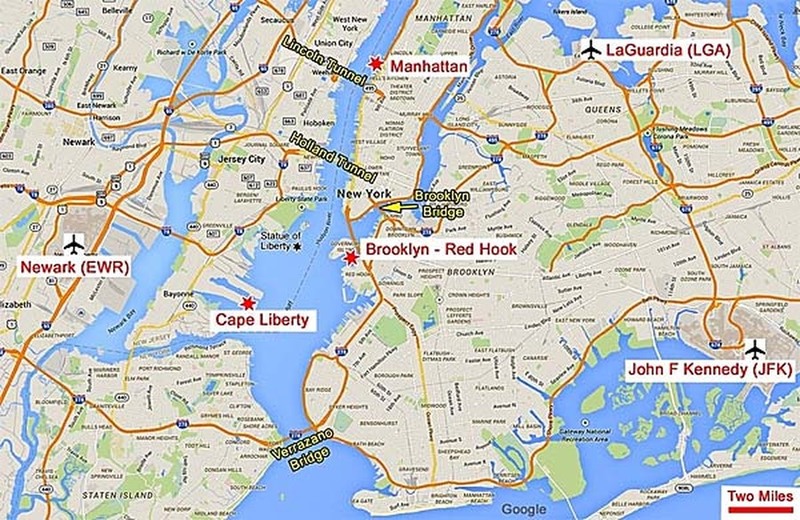 ​There are 3 cruise ports at Manhattan and Brooklyn-Red Hook in New York and Cape Liberty in Bayonne New Jersey as shown on this map. 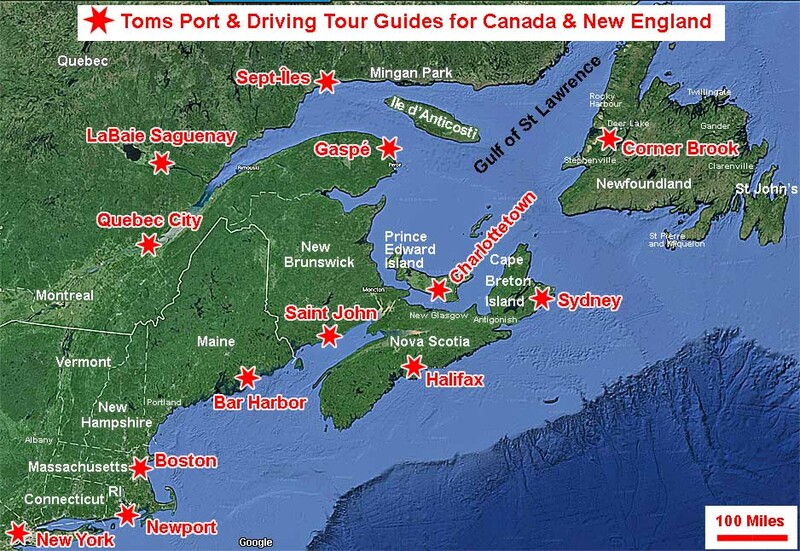 These ports are often the start or end port for Canada & New England Cruises. My port guide focuses on travel options to/from cruise terminals in New York and New Jersey which may involve connections between airplane and/or train, taxi/limousine, rental car, personal car, drop off at the port from a personal car, ship's transport bus, public bus, or interstate coach. If you are lucky enough to spend some time in New York, I've included maps and links to the Official Visitor Guidebook, sources of free pdf maps, and travel tips. It's famous for America's Cup races. It's upscale with attractive, colorful, historic buildings and new buildings designed to look old. The "Old Quarter" is across the street from the cruise ship tender dock in an area with museums, shops, cafes, and restaurants near sailboats in the harbor. The tough decision is where to have seafood. Visit the mansions and walk along the cliffs. World famous mansions include The Breakers, Chateau sur-Mer, The Elms, Marble House, Rosecliff, Green Animals, Kingscote, Hunter House, Isaac Bell House, Chepstow, etc. ​Board the SL2 bus next to your cruise ship. Exit South Station at Atlantic Ave. Walk Northeast to Congress St. It's a 14 minute walk to Faneuil Hall. Boston is an amazing, clean city to explore by walking, trolley tours, harbor tours, etc. The Freedom Trail is marked with brick and painted lines showing the route to sixteen historic sites. In addition to great seafood, steaks, and shopping, there are bus tours to historic sites outside the city. My guide has extensive maps with GPS coordinates and descriptions of sites in Boston and the Minute Men battlefields in Lexington. It's not normally a New England Cruise, however, there are cruises from Boston that dock in Bermuda for several days. This is a unique opportunity for a cost effective vacation. Hotels in Bermuda tend to be very high price; the same is true of the restaurants. Passengers on a cruise ship avoid pricey hotels and restaurants while having free access to all the sites and things to see and do on the island. Your cruise is both a cruise vacation and a free hotel and restaurant in the heart of Bermuda. Wow! Bermuda is a scenic island with colorful homes, beautiful flora, well-manicured gardens, championship golf courses, up-scale resorts, stunning beaches, excellent dining, shopping, etc. Romantics are drawn to the island for candlelight dining and dancing. Celebrities call Bermuda “home”. It's the perfect spot for “R&R”. 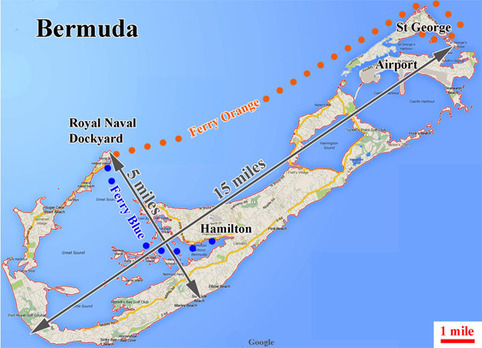 The map left shows the three cruise ship dock areas at Royal Naval Dockyard, Hamilton, and St George. Note there are ferry boats, buses, and taxis/tours to cross the island. You can't rent a car, but you can rent a scooter. It's on Mount Desert Island, one of the most beautiful islands in the world with pristine wilderness forests, mountains, lakes, coves, scenic fishing villages, and rugged Atlantic coastline. 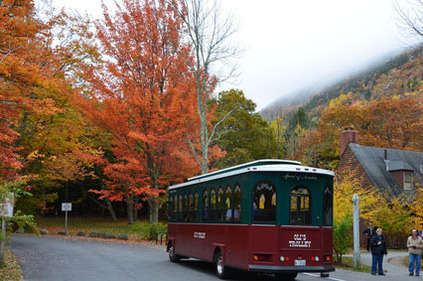 Options to explore the area include trolley, horse drawn carriage, taxi, scooter, walking, bicycling, boat tours narrated by forest rangers, a 151-foot 4-masted schooner, a 90-foot jet powered catamaran, lobster boat, whale watch boat, and naturalist boat tours. For sports enthusiasts, there are hiking trails, kayaks, rock climbing, etc. ​It's a “pedestrian friendly” city port with interior, climate controlled, walkways above and below ground connecting restaurants, shopping, hotels, museums, entertainment, churches, historic sites. 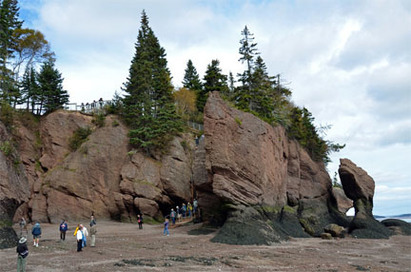 The stunning Bay of Fundy has the highest tides in the world, 55.8 feet. The natural setting is perfect for exploring the shoreline, forests, parks, mountains, wildlife habitats, whale watching, etc. My port guide includes a rental car driving tour to St Martin Sea Caves. If you plan to visit the incredible “Flower Pot Rocks” (photo at right), book the ship's excursion tour because the park is a long distance and the ship's tour bus is the most time-efficient method of travel. It's also helpful to have a guide. Cruise ships dock next to the scenic and historic downtown area. It's only a short walk along the waterfront boardwalk to museums, the Citadel, public gardens, restaurants, breweries, shopping, etc. Halifax is an important historic area and a major site for immigration from Europe. The Titanic Museum is a must visit. You can explore the town on foot or use one of the tour buses. You'll need transportation to Peggy's Cove and the Titanic Cemetery where grave markers are laid in the shape of the ship's hull. There are six car rental agencies within a four minute walk of the Halifax cruise ship docks. Unlike a bus tour, rental car touring allows you to choose where to go, when/where you stop, and how you spend your time = total freedom for independent touring! ​You can’t take good photos from a bus due to reflections in the windows, movement, and obstructed views out the windows. In a car, you can stop anywhere, roll down the windows or step outside for postcard photos. Car rental is inexpensive especially for two people, a family, or small group. 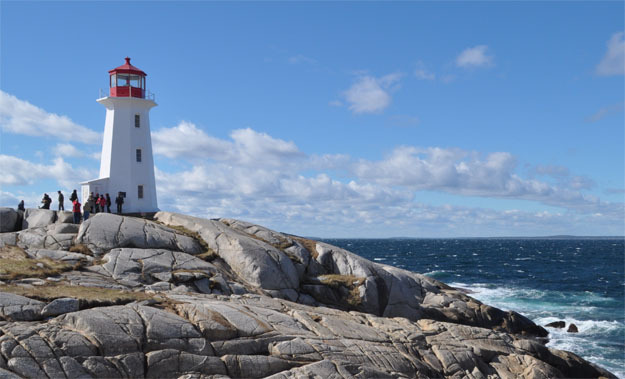 ​My guide has detailed maps, driving directions, GPS coordinates, photos, and descriptions of Lunenburg, Peggy’s Cove, Fisherman’s Cove and Titanic Cemetery. There is not much to do within walking distance of the dock, there aren't many taxis near the port, and public transit is limited. PLAN AHEAD for your shore excursion. The best private tour guides are fully booked 3-6 months before your ship docks. Reserve a rental car ~ 3 months ahead. Even the ship's excursion buses might "sell out" before the ship docks. I met a couple who believed they didn't need a tour; their plan was to walk around the town. I asked them what they did in Sydney. They said there wasn't much to see. They visited a bowling alley and the Walmart. The 4000 square mile Cape Breton Island. 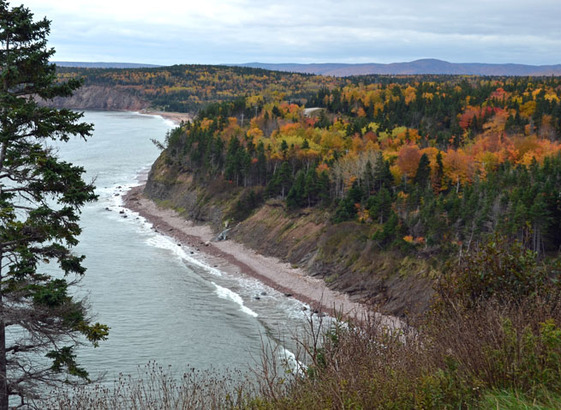 It's one of the world's most scenic islands where you can see "Fall Colors" on Cabot Trail (photo at left), rugged Atlantic coastline, mountains, forests, and Bras d'Or saltwater Lakes. The area has a rich Celtic history of settlement by Scots and steel production using local iron ore and mining coal from under the sea. During tourist season, re-enactors staff the Celtic Highland Village, Fortress Louisbourg, and other areas taking you back in history to experience what life was like years ago. The Alexander Graham Bell museum is a must visit. WOW! What a fantastic, picturesque island with gentle rolling hills, farms, fishing villages, the gorgeous Prince Edward Island National Park, the world famous Anne of Green Gables farmhouse, and Confederation Bridge, an engineering wonder. The natural beauty and charm of the island are enhanced with many excellent restaurants, shops, golf courses, and entertainment venues including theater, festivals, music, street fairs, art fairs, and celebrations. The 2014 schedule included 150 festivals and events. Cruise ships dock downtown. It's perfect for a self-guided walking tour of the city, but you'll need transportation to the National Park, Anne of Green Gables farm, etc. Charlottetown is perfect for renting a car. My driving tour guide has highly detailed directions, photos, maps and GPS coordinates to explore the area in a rental car. Newfoundland is famous for beautiful mountains, lakes, waterways, and parks. Corner Brook is strategically located in a valley of gently rolling hills providing access to scenic rides along the shore and to the Captain Cook Monument for panoramic views of the area. Take the free port shuttle bus from your ship or you can walk 10 minutes to city center. Corner Brook is ideally suited for walking. You can access the well-groomed Stream Trail network next to your ship and follow the trails throughout the city, the hills, and mountains. There are park benches to relax and enjoy the views of the harbor, small lakes, streams, and the mountains (photo right). We took the ship's bus tour to Captain Cook historic site and East Shore for $ 80/person. A flat rate taxi tour next to the ship would have been cheaper. It's $ 125 for two people. My guide lists restaurants and shops in the city and includes detailed maps, GPS coordinates, and descriptions of the tourist sites. The peninsula is 12,000 square miles of mountainous forest with 10 ecosystems, 696 plant, 225 land bird, and 26 species of birds of prey. Fish are abundant as are seals, porpoises, 7 species of whales, and land mammals including black bear. The breathtaking beauty of rock formations, sea cliffs, and mountains in Percé attracted artists skilled in many mediums. Today, Percé is the cultural center. Forillon National Park is an idyllic natural setting, the “Crown Jewel” of Gaspé Peninsula. The port guide includes details for renting a car to explore Forillon Park. Unfortunately, the Budget Car Rental which was next to the tender dock at the marina has closed since I published the port guide. National Car Rental is setting up a system to move reserved cars from the airport to the marina where the ship's tenders dock. NOTE: Be sure to PLAN AHEAD and book a private tour or the ship's excursion because there is not much to see, nor do withing walking distance of the ship's tender dock at the marina. It’s in 200,000 sq km of of beautiful, unspoiled forest, a favorite location for hunting and Atlantic salmon fishing. Many species of fur bearing animals and waterfowl are found in the boreal forest, on the tundra, peat-lands, and salt marshes. Aquatic wildlife is abundant. It’s one of the best whale watching sites in the world and it has one of the most important protected marine bird sanctuaries in Eastern Canada. The area around the city has parks, rivers, beaches, lakes, forests, mountains, and islands offering every conceivable form of outdoor activity including hiking, climbing, canoeing, rafting, para sailing, surfboarding, horseback riding, golf, etc. in the summer plus a full spectrum of winter outdoor activities. It’s a 2 hour spectacular drive from Sept-Îles to Mingan National Park that has 30 islands and 1000 islets and the largest collection of limestone monoliths in Canada. Sept-Îles is the only large city in this remote area of northern Quebec. There are many things to see and do including walking tours of the city, visiting museums, restaurants, shops, plus boat tours from the marina, and rental car and bike rental to tour inside and outside the city. The Saguenay river fjord is the fourth largest fjord in the world. It's the envy of Norway. The area is populated by master craftsmen, artists, and actors. It's the most friendly and welcoming port. We were greeted by re-enactors in period costume as fur traders, Indians, local craftsman, town officials, etc. They welcomed us with fresh baked blueberry pie, maple toffee candy, chocolate, etc. 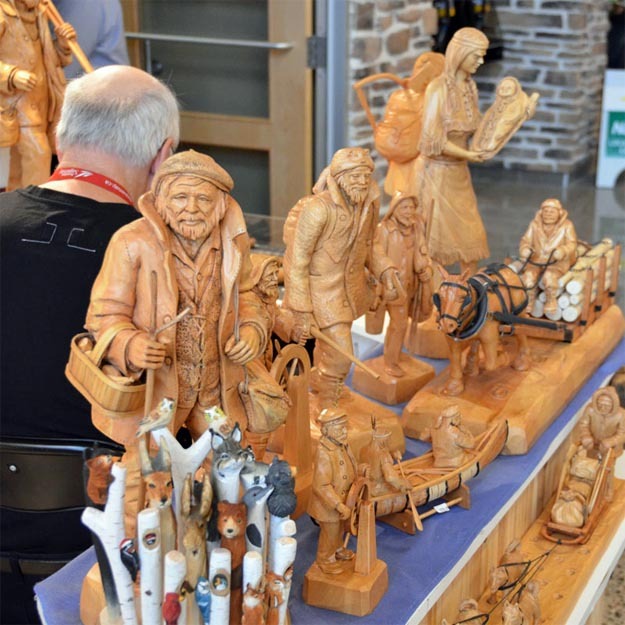 The cruise terminal is packed with high quality, distinctive products by master craftsmen including clothing, wood carving, hand made purses, blown glassware, jewelry, artwork, soap, preserves, etc. There are boat rides, kayaking, and hiking trails. The Chicoutimi district has shopping, restaurants, and some of the best entertainment/festivals you will find. TIP: Select a cruise that stops at Saguenay; it's an excellent port. Check to see if your cruise ship offers tickets to the La Fabuleuse show or other performances in the indoor theater with seating for 2300. The shows get rave reviews. There are several different shows. We saw the “La Fabuleuse Cultural Show”. This is a great and entertaining show of the history of Saguenay from its discovery in 1692 through the great flood of 1996. With a cast of over 200 local actors, animals, amazing audio-visual techniques, including cannons, rifles, fire, water, automobiles, and songs, the cast did a great job informing the audience of the history of the area and town. It was a fabulous show. I highly recommend it. I believe they present this show in French and English; our show was English. It's like visiting France without the hassle of crossing the Atlantic Ocean.Quebec City is the most beautiful port I've seen. If your ship docks at the main berth, you'll have gorgeous views of Le Château Frontenac, the most photographed hotel in the world. 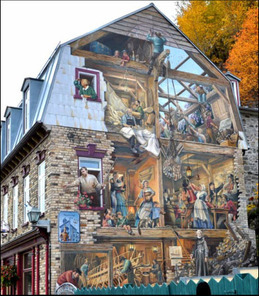 Quebec has the beauty and charm of the best French cities. Explore the city on foot and on public buses. Take note of the majestic architecture, visit beautiful churches, buy paintings by local artists at the sidewalk stands, admire the paintings on the sides of multi-story buildings (photo at left), visit museums and historic sites, etc. Shop at high end boutiques for fashion clothing, jewelry, furs, artwork, and collectibles. Enjoy the cuisine, wine, and bakeries. It doesn't get any better than this! There are six berths for cruise ships along a two mile stretch of the St Lawrence. My guide has maps, GPS coordinates, and detailed walking tours and bus routes for the city. It's easy to access the old town area by walking and public bus, but you'll need transportation to areas outside the city e.g., Ile d'Orleans Island, Montmorency Falls, Basilica Sainte Anne de Beaupre, and Baie Saint Paul. 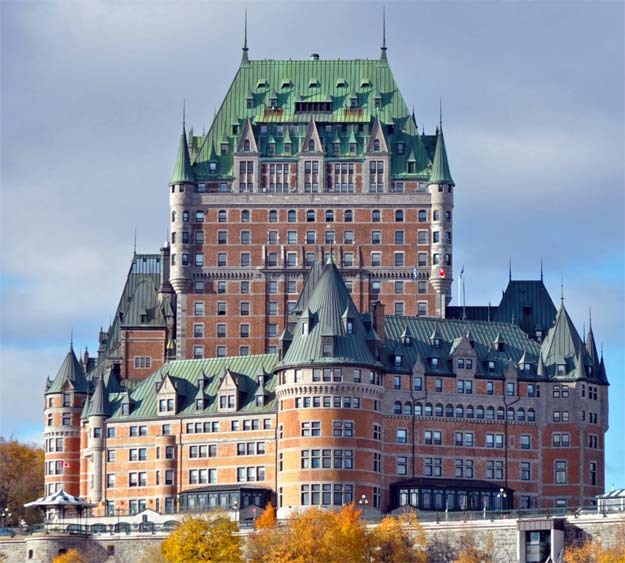 TIP: Book a NY-Quebec_City-NY cruise that docks in Quebec for several nights. We were on the Emerald Princess docked in Quebec for three days. I rented a car, parked it next to the ship at night, and drove hundreds of miles exploring the area during our three day stay. My driving tour vacation avoided the high cost of a Quebec City hotel. The Emerald Princess was my hotel in a high-end neighborhood, docked across the street from Le Château Frontenac.